The initiative aims to pack and ship 100 boxes per month in 2019. SEMINOLE, Fla. — What began slowly and full of hope is now an energetic movement to help military strangers. Plainly, the Operation: Military Matters non-profit is out of control in the best way possible. Since then Graci Tubbs, 13, has been inspiring others to give back to the military on the other side of the world. 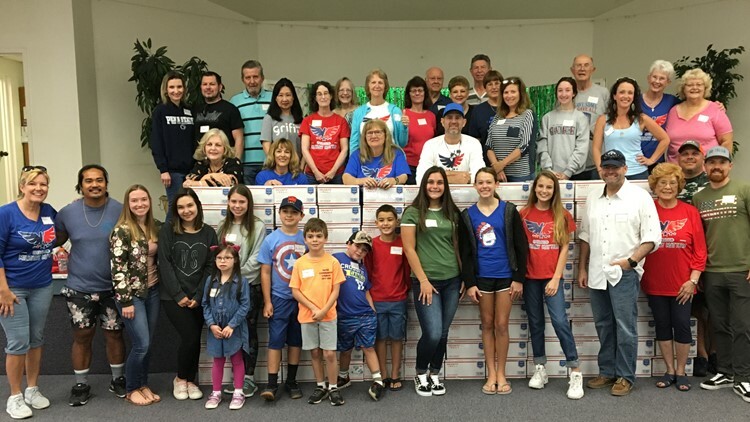 Graci’s family started Operation: Military Matters nearly four years ago and has packed over 1,600 care packages since then. Each box is filled with non-perishable items soldiers crave like gum, beef jerky, coffee and dry socks. The boxes are shipped overseas and received warmly. Military is a big part of Graci’s family. Her uncle, Steve Tubbs, and both her grandfathers served in various capacities in the Army. “They all helped me a lot,” she said. They also inspired an initiative that aims to pack and ship 100 boxes per month in 2019. The biggest hurdle to care packages is shipping. Most of the items that go in boxes are donated but shipping adds up quickly. Strike Force Energy helped Graci with a grant to offset costs of supplies and shipping for the March delivery, which went to Kuwait. Army members sent the Tubbs’ a letter of thanks after the box arrived in the Middle East. “It helps out,” Cavanaugh said. Graci spends Saturdays packing the boxes. The last packing party was staged in the fellowship hall of her church, Faith Community, in Seminole. It’s that service that’s making a difference for servicemen they’ll likely never meet. “It gets bigger every year, so it’s exciting,” Graci said.